Hoxton Garden Primary School in Hackney has achieved the Inclusive School Award with Centre of Excellence status. Hoxton Garden Primary School is situated in Hackney in East London. It is part of the Viridis Schools’ Federation, formed of 3 local Primary schools; Hoxton Garden, Southwold and Orchard. Sharing a joint Governing Body and Executive Headteacher, the schools work effectively together sharing expertise and a passion for providing the best learning experiences for their pupils. Hoxton Garden is a growing two form entry Primary School, currently having approximately 333 pupils on roll. The percentage of pupils eligible for Pupil Premium and who speak English as an additional language is significantly higher than the national average. The school also reports an increasing number of pupils with SEND and has a higher than average number of pupils on its SEND register. The school also experiences high mobility of its pupils; in some year groups being approximately 20%. A significant number of children enter the EYFS at well below age-related expectations; however, the percentage of children achieving a good level of development at the end of the Reception year is above the national figure. Pupils at the school make good progress and achieve well, with results at the end of Key Stage 2 being significantly above the national average across all subjects. The school is committed to inclusion, believing that every child has the right to succeed. It works hard to overcome any barriers to learning for its pupils, in order that they can achieve success. Inclusion is viewed as being ‘everyone’s responsibility’ and is driven by an experienced Inclusion Deputy Headteacher. The inclusion team consists of an Inclusion Manager/Deputy Headteacher, a Senco, learning mentor, teaching assistants who have additional training in SEN and EAL support and an in-house therapy service. 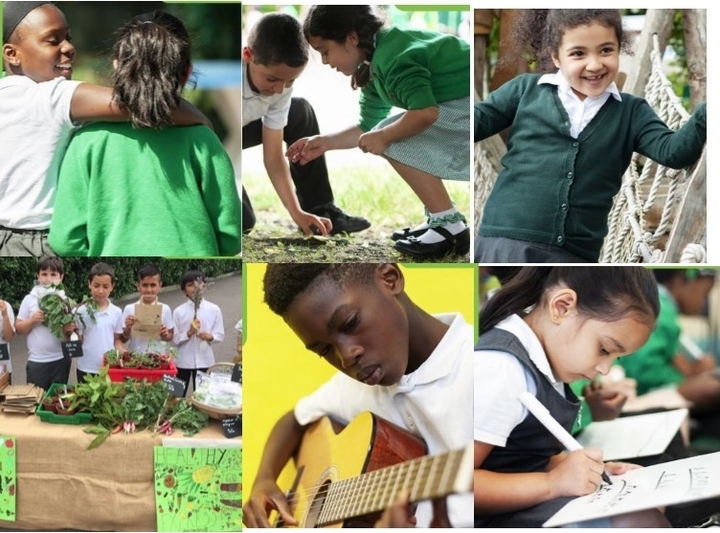 With a number of vulnerable pupils and families, the Headteacher emphasised the importance of pupils feeling that Hoxton Garden was ‘their school’ within which they could learn, be successful and feel valued. The school was awarded Inclusion Quality Mark status in November 2015 and has worked hard to develop and improve their inclusive practices since that time. Set in a densely populated urban area, Hoxton Primary has maximised the physical space that it has in order to provide the children with a range of enabling learning environments. The EYFS outdoor environment is particularly impressive and reflective of the key areas of learning. Classrooms are bright and inviting, reflecting all areas of the curriculum, with working walls and interactive displays. Visual timetables are provided for individual pupils, according to need. The quality of displays throughout the school is very good and reflective of the school’s creative curriculum. Every class has a welcome board where pupils share what they would like to learn in the year and what it means to them, together with their agreed class rights and responsibilities. In Key stage 1 reading areas are inviting for pupils and in Key Stage 2 classrooms have ‘inspiration stations’ where pupils can go and work quietly to develop their thinking and impact upon their written work. Behaviour for learning observed throughout the assessment was excellent. The curriculum at Hoxton Garden Primary is thematic and skills focused and is enhanced through a number of enrichment weeks held throughout the year. The school also provides a wide range of subsidised extra-curricular clubs for its pupils from Years 1 to 6. Pupils are given a wide range of opportunities for them to take responsibility and be meaningfully involved in the life of the school, including class councillors, school councillors, peer mediators, lunchtime helpers, PE ambassadors, digital leaders, and art ambassadors. The school also runs a breakfast and after school club. The Headteacher, Inclusion Lead and whole staff share a very cohesive and clear vision of how inclusion operates in practice throughout their school. There is a shared responsibility for inclusion and for meeting the needs of all their children. Planning, assessment and monitoring systems are highly effective. Pupil progress is closely tracked, with pupil progress meetings being held termly. The school runs a wide range of interventions and these are time limited and closely monitored for impact. SEND pupils have Individual Education Plans, which include clear targets and timetables for support. The school works effectively with a range of outside agencies. Staff who are newer to the school feel very well supported and one NQT stated that she ‘felt very much like part of a team straightaway’. Continuing Professional Development is given a high priority, with both teaching and support staff receiving weekly CPD training. The Headteacher stated that: ‘CPD is rigorous, planned for the year and responsive to the needs of the federation and individual schools.’ CPD includes training in SEND and inclusion and how best to engage and support the differing learning styles of all pupils. The well-being of both staff and pupils is given a high priority. Senior leaders are very mindful of the importance of helping to maintain a work-life balance for their staff. The school has been selected to be a pilot school for the ‘Well Being and Mental Health in Schools’ Project. Through this, the school will be provided with in-school therapy and will focus on the well-being of the staff and how better to support the pupils in class. Pupils love their school: ‘School is great; very exciting and you can learn a lot.’ They enjoy the range of opportunities that are on offer to them, including all the clubs that they can choose to attend after school. They feel safe in school and say that children behave well. Parents feel very well supported by the school; ‘The support is amazing from all staff.’ They appreciate the open-door policy that the school operates. Their children are very happy at the school and one parent who has moved some distance from the school made the decision to keep her child at Hoxton Garden for that reason. The school provides a range of opportunities for parents/carers to become involved in the school and the weekly coffee mornings cover a range of topics which help parents/carers support their child’s learning or help them develop their own learning and skills. The school belongs to a number of partnerships beyond the school and federation. It also places great emphasis on research-based practice, creating a learning community of staff and pupils. Individual phase leaders across the federation are required to undertake action research related to their phase and given the additional time to carry this out. They are required to report back in a formal way. The federation holds a half-termly SLT meeting, which includes phase leaders, in order for best practice to be shared. Action research projects, once completed, are also published in a Viridis Federation publication.